Find out how your users will react to unknown USBs they find! 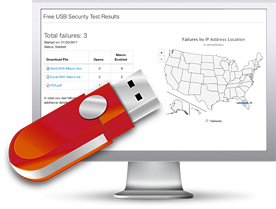 Find out now what your user’s reactions are to unknown USBs, with KnowBe4's new Free USB Security Test. You can download our special, "beaconized" file onto any USB drive. Then label the drive with something enticing and drop the drive at an on-site high traffic area. If an employee picks it up, plugs it in their workstation and opens the file, it will "call home" and report the "fail" to your KnowBe4 console. And for Office documents, if the user also enables macros (! ), additional data is tracked and geomapped. This is fun. Get your USB Security Test now!